“Victory in Europe Day” or “V-E Day” is the day that marks the end of World War II in Europe, when the Allies formally accepted Nazi Germany’s act of military surrender. 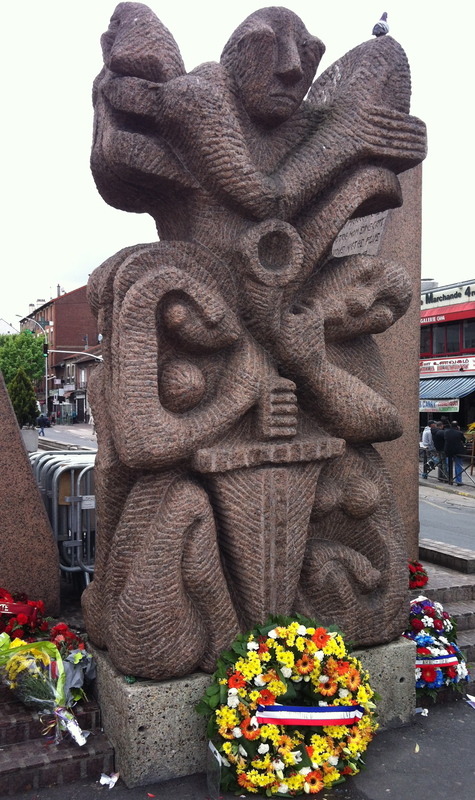 Following the fall of Berlin and Hitler’s suicide on April 30, 1945, control of Germany passed into the hands of Admiral Karl Dönitz, who established a short-lived new German government named after Flensburg, the town on the Danish border where he was holed up at Germany’s naval academy. Allied forces were advancing rapidly on what remained of the German army in northwestern Germany and, on May 4, Dönitz surrendered to British Field Marshal Bernard Montgomery near Hamburg. The next day, Dönitz dispatched representatives to Reims, in northern France, to negotiate a complete German surrender with General Dwight D. Eisenhower, Supreme Commander of the Allied Expeditionary Force in Europe. He gave instructions to drag out the negotiations for as long as possible so that as many German soldiers and refugees as possible could surrender to the Western Allies instead of to the Soviets. Eisenhower would not tolerate the tactic, however, and Dönitz relented, authorizing General Alfred Jodl to sign an act of unconditional surrender. The act was executed at 2:41 am on May 7 and provided that all forces under German control would cease active operations at 11:01 pm the next day. At Stalin‘s insistence, the act of surrender was signed again on May 8 by Field Marshal Wilhelm Keitel at Marshal Georgiy Zhukov‘s headquarters in Berlin. At 11:01 that evening, the war in Europe was officially over. 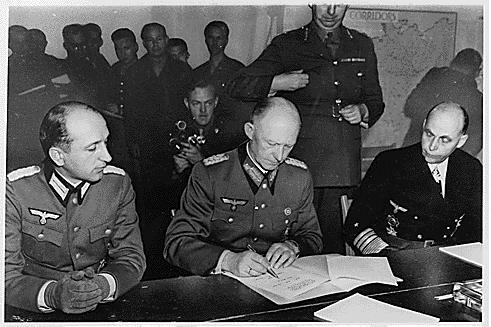 Jodl signing the act of surrender at Reims, May 7, 1945. 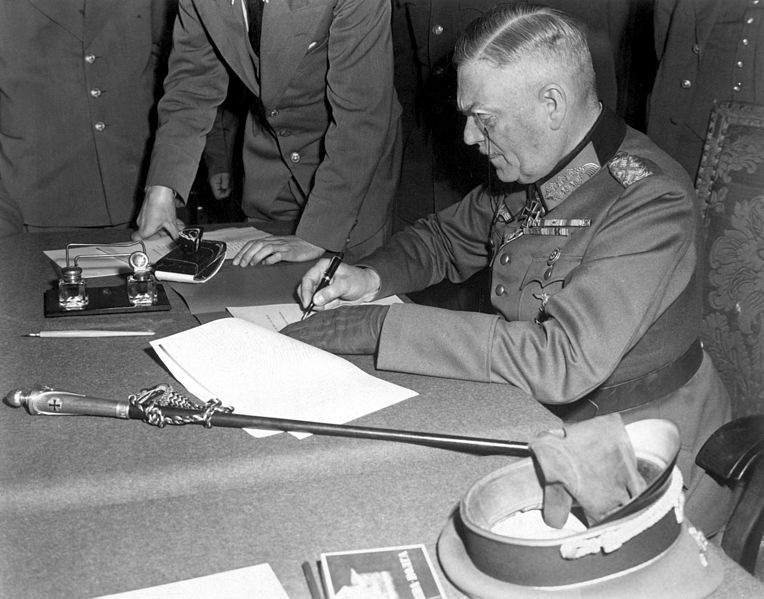 Keitel signing the act of surrender at Berlin, May 8, 1945. Because of the timing of these events, “Victory in Europe” is celebrated on different days in different countries. It is celebrated on May 8 in France and other Western European countries (except for the British Commonwealth, which celebrate the original May 7 signature). Russia and other former Soviet republics celebrate on May 9, because the end of hostilities came that day at 1:01 am Moscow time, due to the two-hour time difference with Berlin. 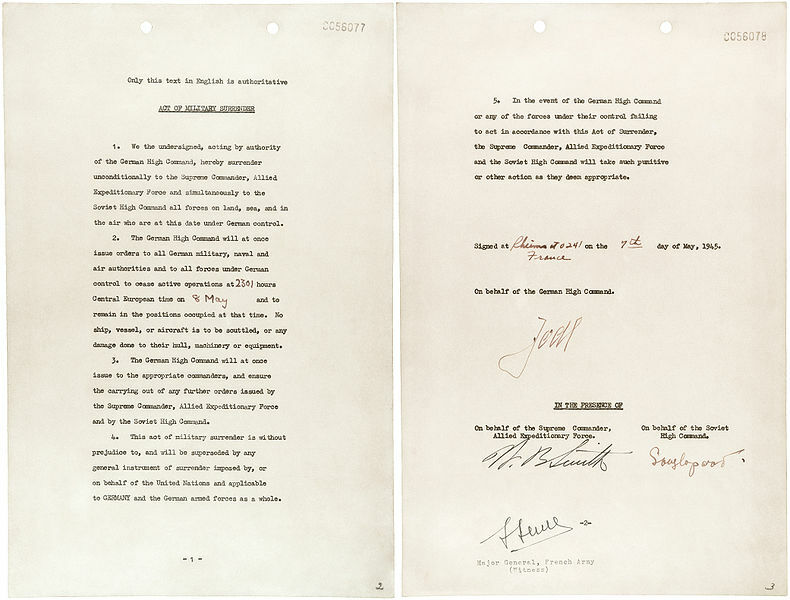 The Act of Surrender signed by Jodl. In France, May 8 became a public holiday of commemoration in 1953, but its status as a public holiday was revoked by the decree of President Charles de Gaulle in 1959. Later, as part of the ongoing reconciliation with Germany, President Valéry Giscard d’Estaing further revoked the “commemoration of allied victory” associated with the day. 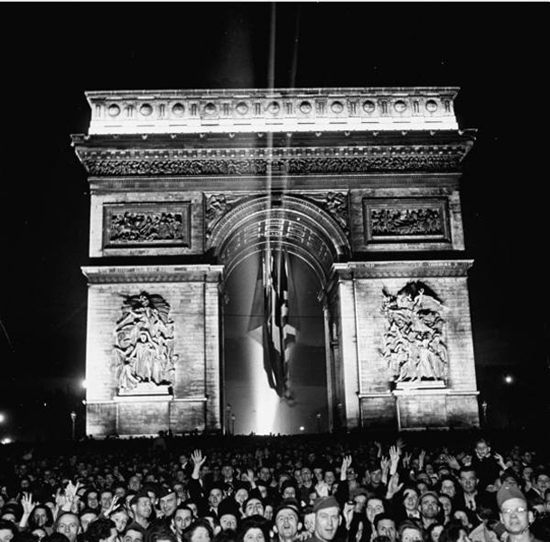 At the request of President François Mitterand in 1981, however, May 8 was reestablished as a public holiday commemorating the Allied victory. Ever since, it’s been one of the spate of springtime holidays when you don’t have to go to work in France, whether or not you know why you get to sleep in … but now you do! 0.00; just had to say – will read in full in a.m.!!!! LOVELY! I just love history……especially when it’s written well and with hyperlinks!!!! PS – If I fix you dinner (after we meet first ofcourse) – could I get you to help me with my wordpress blog which is pretty much a disaster??!!! I think could work something out! We do need to have that coffee that got rescheduled. Next week, maybe? Today is one of four French national holidays during the month of May, including May Day (May 1), Ascension (May 9 this year), and Pentecost Monday (May 20 this year). May is, it seems, the most “holidayed” month of the year for the French. Given that it’s usually the most beautiful month of the year in Paris, that’s just fine with me!